A growing sector, mainly thanks to the export and the recovery of internal consumption, with a competitive scenario that is increasingly characterized by the demand for green products and digital experiences. The market for Italy cosmetics products is worth $12.53 billion in 2015 and is estimated to reach $16.56 billion by the end of 2020, at a projected CAGR of 5.73%. The Italian cosmetics market is the fourth largest in Europe behind Germany, UK and France. Cosmetics consumption in Italy is currently valued at $11 million with a positive growth rate of 0.5% in 2016. In Italy, cosmetics are an indispensable part of the daily routine, which is why the economic downturns of recent years have only marginally affected purchases in value but not in quantity. We are currently seeing an increase in the value of purchases as well. Italian consumers have moved on cheaper channels and price bands without sacrificing premium products, resulting in the so-called «hourglass effect» as the products in the mid-price range are weakened. In 2015 Italians saw the second largest growth in cosmetics consumers in Europe, followed by Germany, France and Spain. The Italian cosmetics market remains anti-cyclical and virtually immune to economic stagnation. By the end of 2016, the value of cosmetics purchased in Italy exceeds 9.9 billion, with the value of 2015 (+0.5%). The make-up industry has achieved the best performance thanks to the expansion of mono-brand chains and selfie culture, always popular. Consumers are looking for multifunctional, effective products that save time. In 2016, multifunctional hybrid products that are able to meet different consumer needs have been tremendously successful. It was the year of compact cushion and face masks for the night, trends that have reached Italy from South Korea, similar to BB and CC creams. However, selfie culture is increasingly widespread in Italy, so, with the exception of multifunctional properties and time saving, consumers are increasingly paying attention to the effectiveness of the product. Single-brand chains are rapidly expanding in Italy, particularly in the field of color cosmetics, especially in the mass market. Mass products offer consumers the opportunity to stay up to date with the latest trends in color cosmetics, in line with the increase of fast fashion. The private label continued to be part of many categories in 2016 in Italy, being particularly important in the bathroom and shower. All major Large-Scale Retail Trade as Esselunga, Carrefour, and Conad offering their shelves to beauty and personal care industries, given the potential of the sector continue to invest in it. What are the sales channels that the consumer addresses for his purchases? Mainly the perfume stores, which account for 20.4% of cosmetic sales, have seen a recovery of 9% compared to 2015, the value of this channel today amounts to € 2,018 million. While pharmacies registered a -1%. Beauty salons, in 2016, increased sales by 2.1%, for a value of 230 million euros, while hairdressing salons grew by 1%. Given the uncertain in economic landscape, Italians look for good quality products at competitive prices. As a result, they use various channels to buy beauty products by integrating in-store shopping with online purchases. The beauty sector registered an increase in sales revenues, with a value of more than 10.5 billion euro, an increase of 5%, a similar increase is expected for 2017. On the turnovers of companies, exports have a big impact, sales abroad in 2016 exceed 4.2 billion euros, with a positive trend of 12%. For 2017 estimates are an increase of 11.5%. Germany is the leading outlet market with a value of exports of 413 million euros followed by France with 380 million and the United States of America with 327 million euros. Accordig to Fabio Rossello, president of Cosmetica Italia, company strategies focus on the product and natural cosmetics, as well as on natural hybrids treatments very popular in Asia, digital innovation with the use of social media and partnership with the hi-tech sector; digital innovation with the use of social media and partnerships with the hi-tech industry; multichannel distribution, exclusive retailers and the so-called direct-to-consumer channel. In Italy, the fashion and perfume binomial is long time and, it seems, indissoluble. In fact, there are a lot of fashion houses that point to this product so far away from the art of cutting and sewing but to affirm the brand, communicate the values and complete the image. Coco Chanel said «Perfume is the basic, unforgettable, unseen, fashionable accessory that anticipates your arrival and prolongs your departure». According to Cosmetica Italia, the fragrance segment is one that does not know the crisis. The consumption of alcoholic perfume in Italy is 12.8% of total cosmetic consumption, with a value over one billion euros. It represents the fourth category in terms of market value, with a 62%, split in female fragrances and 38% in male fragrances, but it represents the first category for man, with 17% and fifth for the woman, with 11% of consumption. Last year, in the domestic market, alcoholic perfume increased by 2.5%, while exports showed the best performance: by comparing the first half of 2017 with the same period of the previous year, exports grew by 19,5%. The market is very dynamic, there has been an increase in supply in the domestic market, 4.6% compared to 2015, with over 183 launches in the first ten months of 2016. More than 90% of the cases concerned new products, new product launches, packaging renewal in 7.1%, 1.6% existing line extensions and 0.5% release. This is about an average of 18 new perfumes every month that came in perfumeries, which have been added to those already on the market. Again this year the trend does not change, with many proposals launched on the market tell the values and philosophy of the brands they represent. Fragrances is expected to record a positive value CAGR of 1% at constant 2016 prices. The prospect of an economic recovery in Italy is likely to support more premium products, with many consumers purchasing fewer but better quality scents. Premium fragrances will post the best performance, benefiting particularly from the success of niche scents, appreciated for their high quality and select ingredients. Skin care is expected to post a value CAGR of 1% at constant 2016 prices. Skin care is surely the most dynamic category of the entire Italian cosmetic industry, thanks also to the investments made in terms of product innovation. In particular, Italian consumers are increasingly looking for skin care products with active ingredients and natural ingredients, a trend that is developing further, another very much sought after is the ease of use and absorption of the product. According to Cosmetica Italia, the body care market seems to be recovering vitality, reversing the fall that has afflicted the previous years. Growth was guided by the two most important subcategories, sunscreens and deodorants. Facial care will continue to be a focal point, Italian consumers want to maintain a youthful appearance as long as possible. Population over 45 years of age in 2013 was 48.6%, while in 2018 it will be 51.3% and the demand for anti-aging products is higher in the population range of 45-54 years. Therefore, cosmetic companies have invested in the development of products for different ages. For example, make-up designed for different demographic classes, young people seek balancing sebum properties, while older people look for products with anti-aging functions. The make-up market in 2016 achieved total revenues of $1.222,7 million, with a CAGR of 3.1% between 2012 and 2016, The sales of lip glosses and lip balms growing by +8.5%, and sales of foundations and tinted creams grew by + 5%. There is now a close link between cosmetic and web companies, so the profile of the sector is increasingly digital oriented. In 2015, 4.7 million users were identified who purchased a cosmetic product at least once in the last six months. About 2 million are habitual buyers, that is, they have bought more than once a cosmetic product over six months. An important issue, if we observe that in 2014 the estimated cosmetic products buyers were about 4 million (+ 18%), also thanks to the new clusters of consumers, Millennial and Generation Z, which in Italy spend on average 27 Euro per capita. The cosmetic industrial sector has been experiencing positive trends for more than ten years, confirming its anelastic structure, this demonstrates the characteristics of uniqueness and excellence. Thanks to producers distributed throughout the supply chain, from the production of raw materials to the finished cosmetic, the Italian cosmetic industry also remains competitive in turbulent economic periods, being able to react promptly with appropriate industrial policies and internationalization, recording in this positive trend way constant. Italian cosmetics are known around the world for the innovation of formulas and service dynamics of manufacturing companies; elements which allow the Italian cosmetics industry to affirm on both traditional and emerging markets. 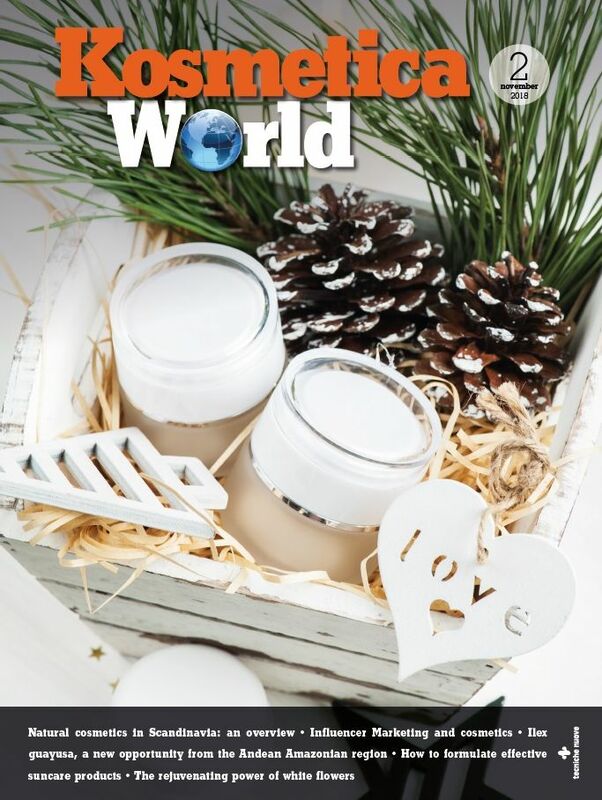 According to Cosmetica Italia and Human Highway, natural will be the engine of innovation. The green cosmetics market in Italy is worth 950 million euros, about 9% of total turnover in the sector. The trend, that will guide the development of cosmetics, will be sustainable production and attentive to the environment and ethical constraints.